Τhose who argue that September is, for various reasons, the best month for holidays are absolutely right. The weather remains warm with plenty of sunshine, while the northwest breeze will slightly strengthen towards the afternoon, reducing the humidity levels. What are you waiting for? Off to the beach! Vlychada: Playing hide and seek with the air, we end up at the beautiful beach with a few umbrellas but abundant beauty. 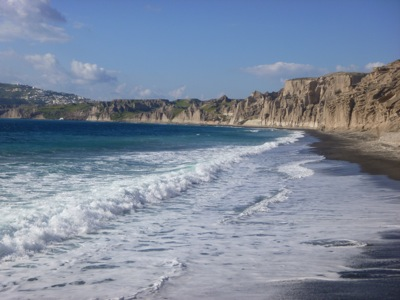 Perivolos - Perissa: Perfect weather for jogging or cycling along the black beach and then swim in the sea! Kamari: Also linked to Perissa by boat.